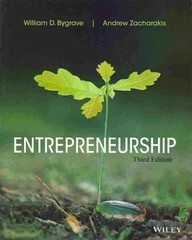 Entrepreneurship 3 Edition Entrepreneurs who need to find the solutions to key challenges will turn to Bygrave. Entrepreneurship, 3rd Edition explores the trials and tribulations of entrepreneurship so that they’ll have the necessary tools to start their own businesses. It offers coverage on social enterprises and ethics due to the rise in green trends and corporate scandals. A chapter on entrepreneurial selling that examines how to sell to multiple stakeholders is included in this text, as well as case studies that provide relevant views. Up-to-date examples and references provide entrepreneurs with the most useful information.